Hello! 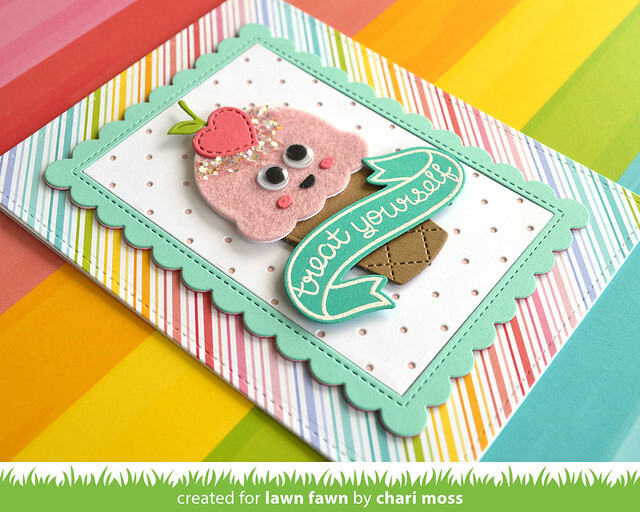 It's Lawn Fawn June Inspiration Week! 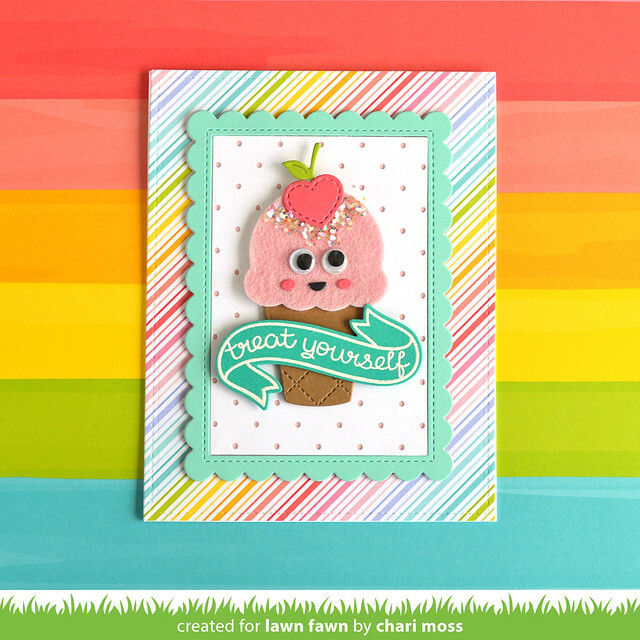 Today we are featuring the new I scream, You scream die set. I think this set is so fun, I particularly love the popsicle and all the stitching details on the pieces. I have two cards to share with you today! Be sure to check out the intro video for this set to see the creation of both of these cards. I colored these bright (and delicious) popsicles using Tombow Dual Brush pens and water to create a fun tricolored treat. The sticks are craft sticks from Michaels. I thought this added a nice realistic look. 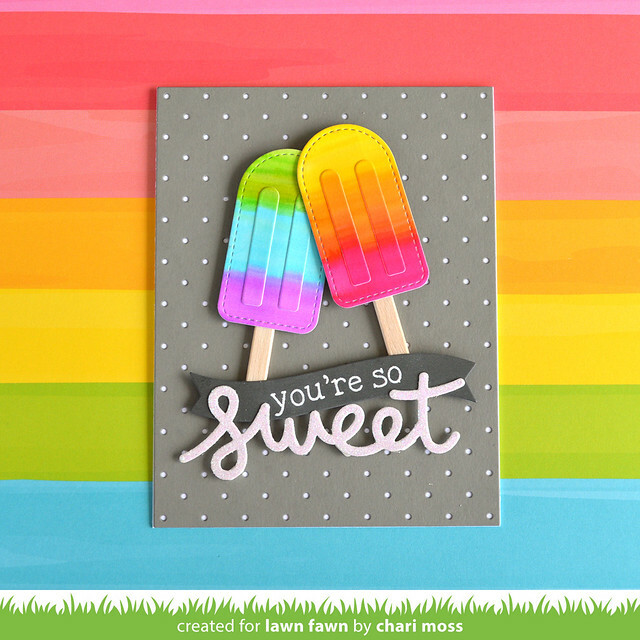 I used Narwhal cardstock and the Itsy Bitsy polka dot backdrop die to create a nice neutral background so the brightly colored popsicles would really pop. The sentiment is made with a white glitter cardstock cut with the scripty sweet die and white embossed Smitty's ABCs to spell out "you're so" on a curved banner (from the shadow box ocean add-on set) cut from Storm Cloud cardstock. 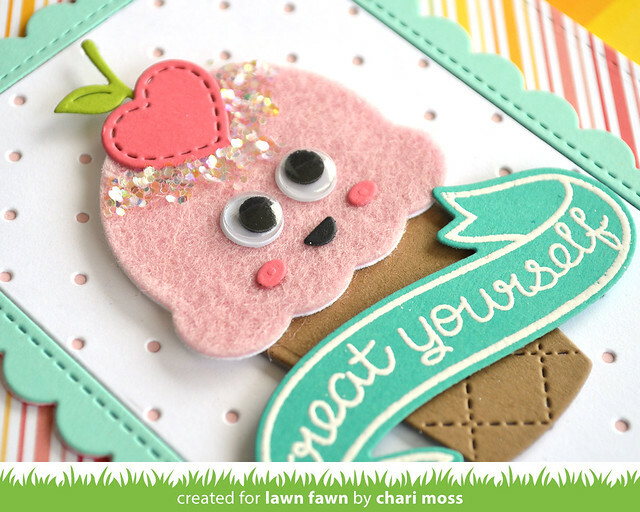 I cut the ice cream for my second card from pink felt for some fun texture. I think it makes it look like it was freshly scooped at the ice cream shoppe. The background is Really Rainbow paper with one of the new Stitched Scalloped Rectangle frames and an itsy bitsy polka dot insert. I layered a few fames to get a thicker die cut and used different colors so there was variation if looking at it from the side. The sentiment is from the mini set Treat Yourself and is white embossed on a Bannertastic banner on Peacock cardstock. I added some fun googley eyes and chunky glitter sprinkles to finish it off. If you would like to see exactly how I created these cards please check out the I Scream, You Scream intro video! 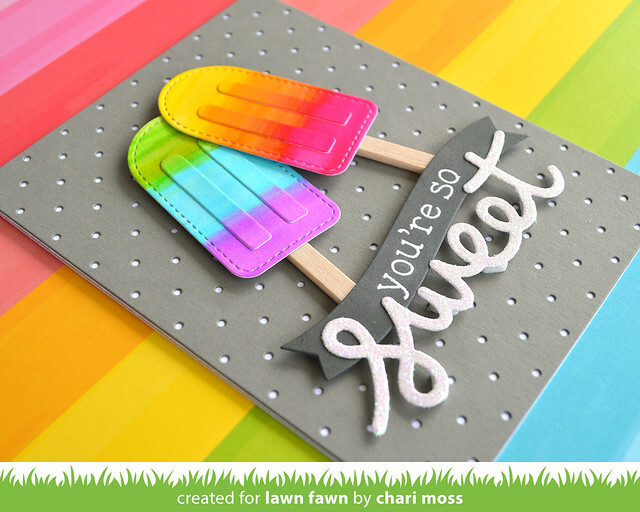 Check out the Lawn Fawn Blog for more inspiration with this fun die set. Super sweet. Live the tricolor treats and the googly eyes. So colourful and delicious. Love that you used felt for the ice cream on the second card. Two absolutely yummy cards ! !